These are super easy to make and offer a slightly less tart version of lemon bars, combining the sweetness of the Meyer lemon with the perfumed essence of mangoes. 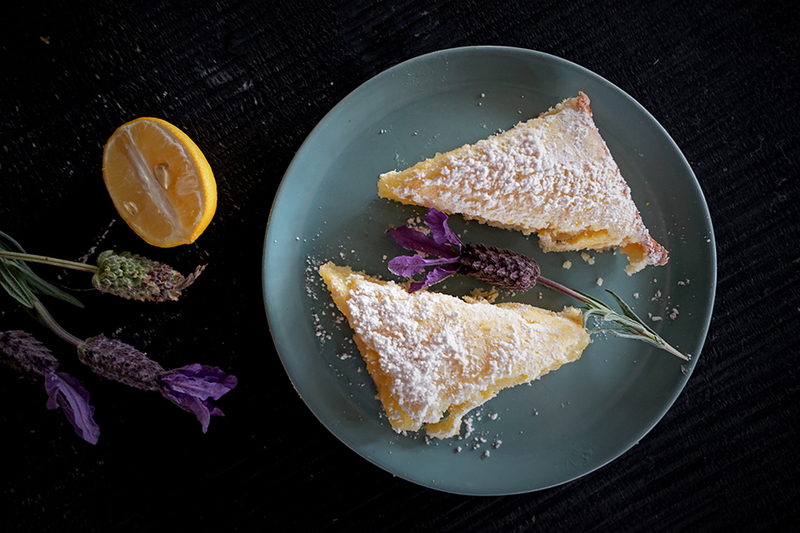 The lavender flowers in the crust are optional, but give a wonderful floral essence to these that makes them rather special. Pre-heat over to 350 degrees F. Butter a 9” X 13’ inch pan or line with parchment paper. Using your fingertips, mix together sugar, salt, zest and flowers. This will blend all the oils from the zest and the flowers into the sugar. Cream the butter and sugar/flower mixture together until light and fluffy. Add the flour and mix until crumbly. Pour the dough into the prepared pan and spread evenly over the bottom, pushing and flattening down with the palms of your hand. Chill in the refrigerator about 10 minutes and then bake for about 15-20 minutes, or until lightly golden. While the crust is cooking prepare the filling. Whisk together the eggs, sugar, zest, mango purée, lemon juice and flour, until the mixture is smooth and creamy. Pour the filling over the pre-baked crust and place it in the 350-degree oven for about 30 minutes or until the filling is set. Let cool to room temperature and then dust with powdered sugar before serving. It can also be refrigerated for a colder version.